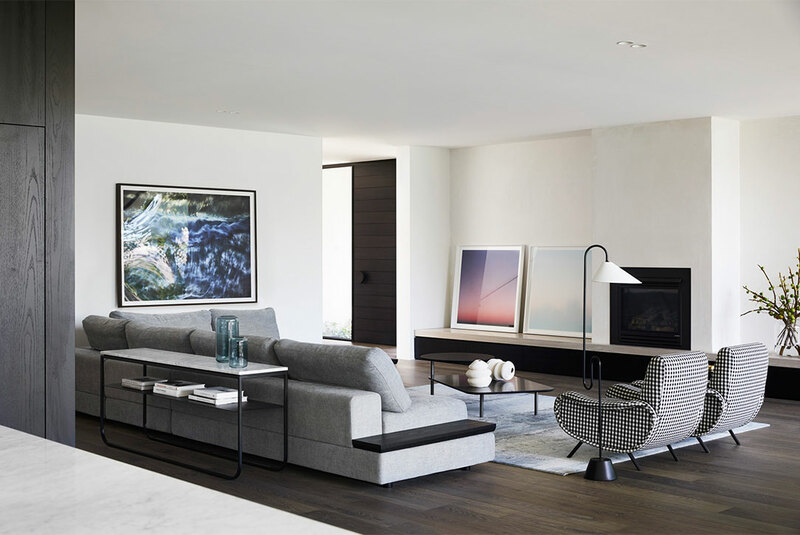 An emotional connection to site was the catalyst for ‘Brighton Residence’ by Studio Tate, a large family home that balances zones for intimacy and entertaining with outdoor living anchored by a blossom tree planted ten years earlier. 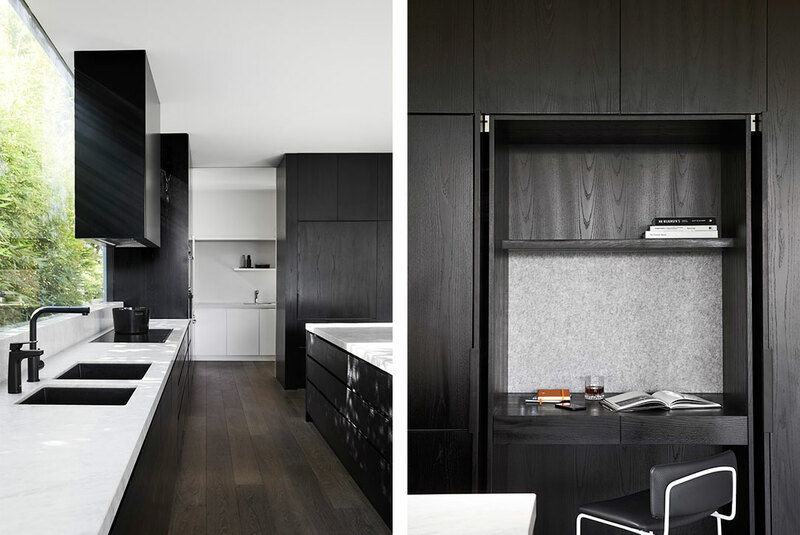 Having lived on the site for more than a decade, the client had a clear vision for the new home they’d been dreaming of. 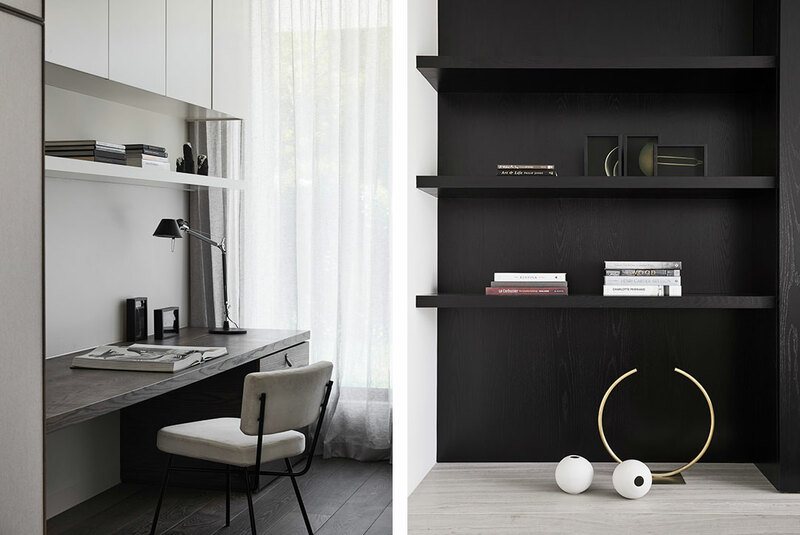 Working closely with Studio Tate their vision for a light-filled, warm and inviting contemporary residence was realised. 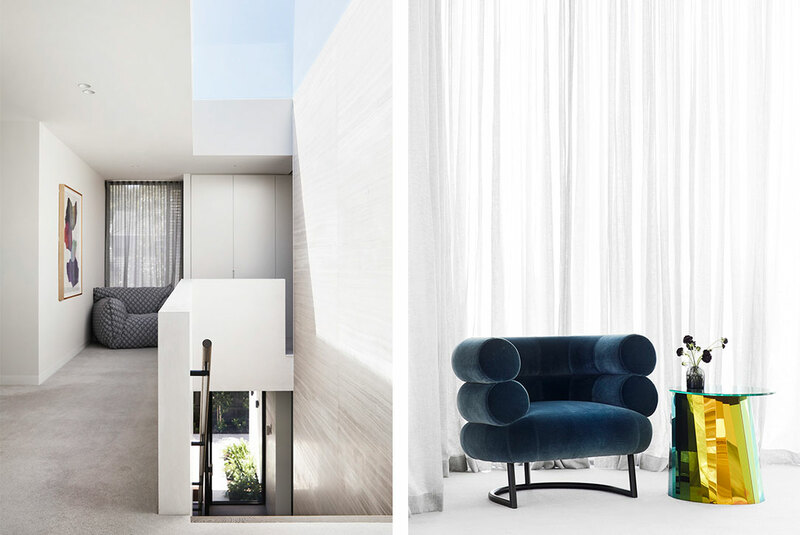 “The cherished blossom tree informed much of our space planning and became a wonderful muse throughout the project,” says Alex Hopkins, principal interior designer at Studio Tate. 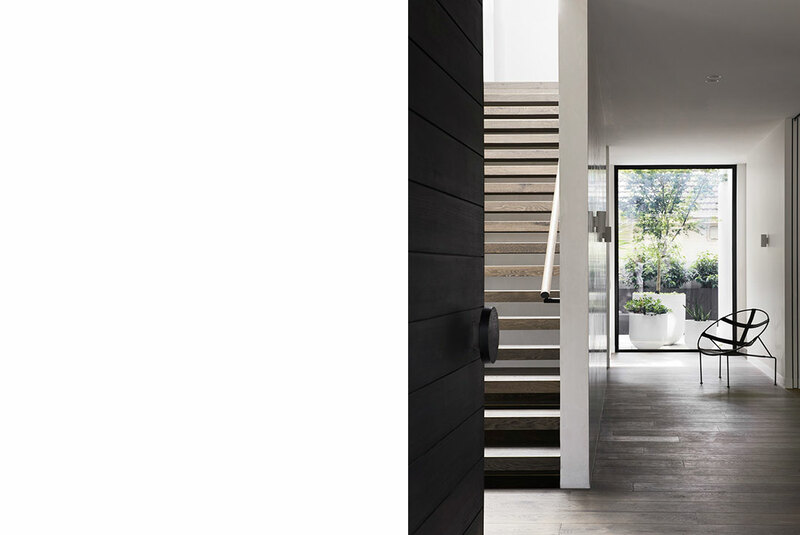 To establish a connection between indoors and out, a wall clad in limestone extends from the house along the entryway. Upon entering the home, visitors are greeted by a central stair leading to first floor bedrooms and a basement wine cellar below. Open treads and an expansive skylight above ensure all levels are flooded with light. 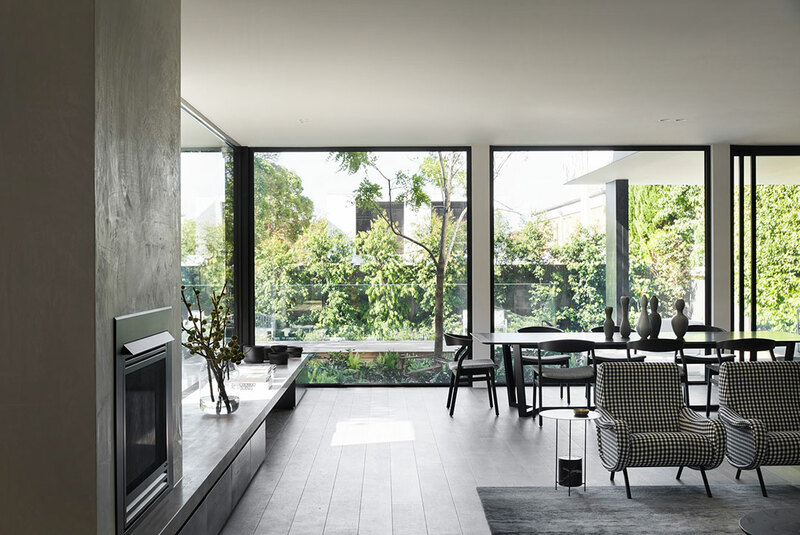 This connection to the outdoors persists throughout the home: a formal living room opening onto a private garden, floor-to-ceiling glazing framing a picturesque outlook in the study, a glazed kitchen splash back for an ever-changing panorama, and gently dappled light filtering through external timber screens that slide along the façade of the building. 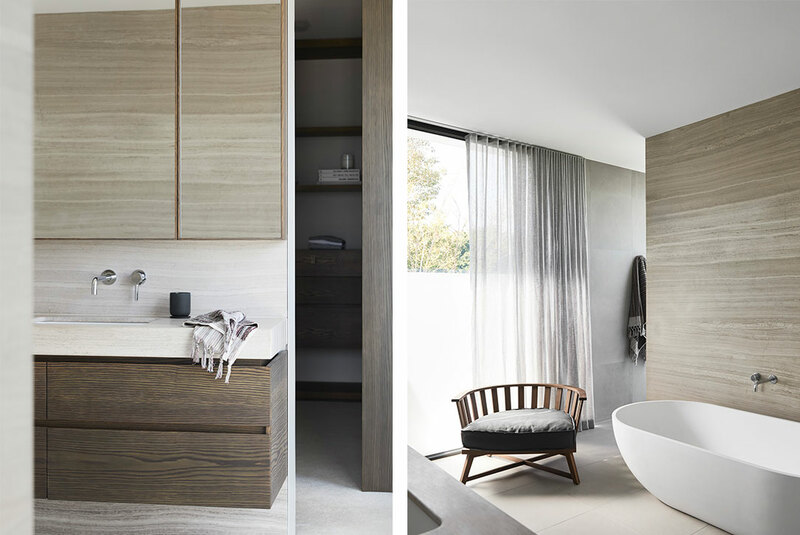 While the palette is largely monochromatic – custom black-brown floorboards, ebonized timber veneer joinery, Serpeggiante limestone and Cararra marble – a downstairs powder room offers a welcome explosion of colour with blue concrete floor tiles, a striking Bardiglio marble vanity, and brass tap ware. 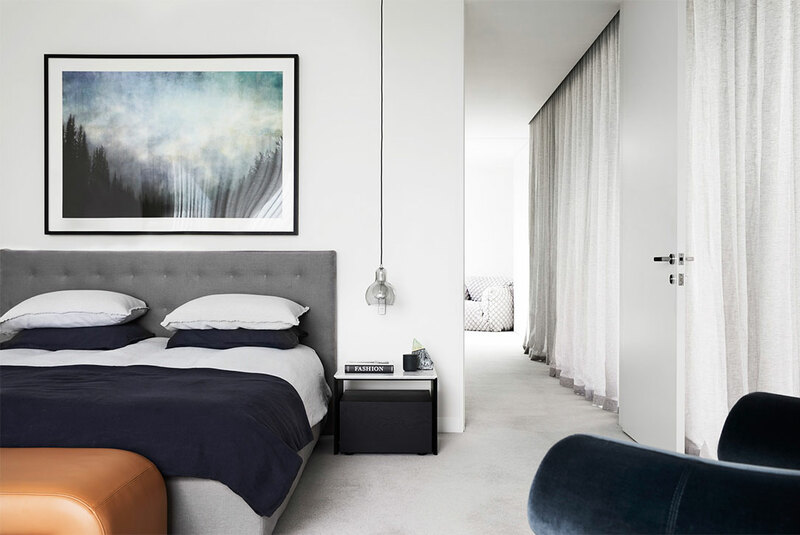 Designed to fulfil the growing requirements of a family of five, Cosham is a private home that marries sophistication and function. 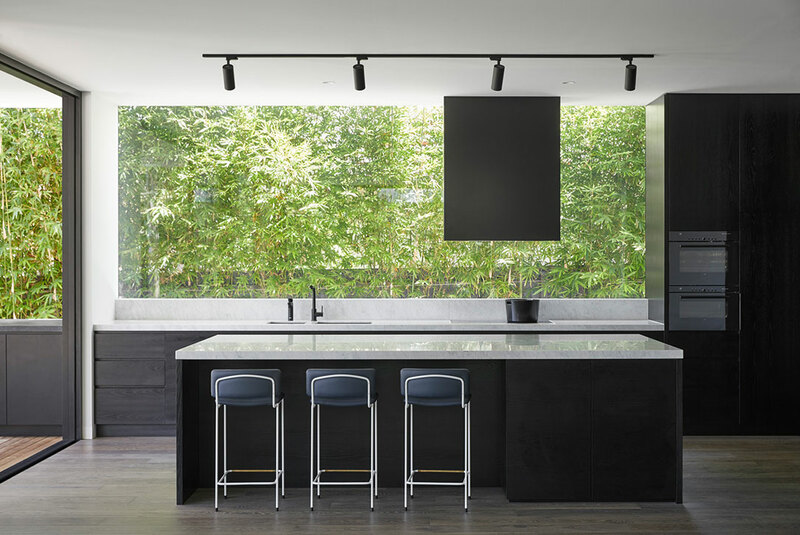 Stone walls, timber screens and black steel are softened by carefully designed gardens and a timeless interior palette; creating a home that ties in with its sophisticated location in Melbourne’s Brighton. 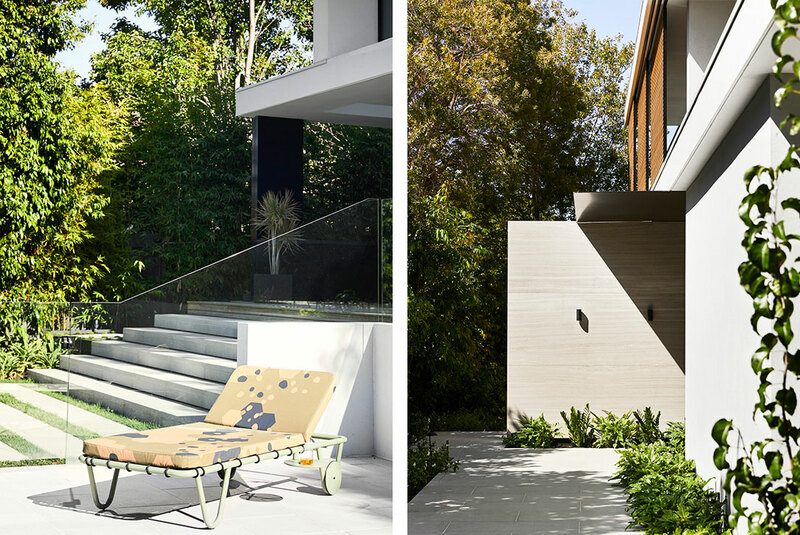 As the clients had lived at the property for ten years prior to demolishing and building a new home, the client brief was largely informed from a place of experience; understanding the orientation of the land, and what they loved most about living there. 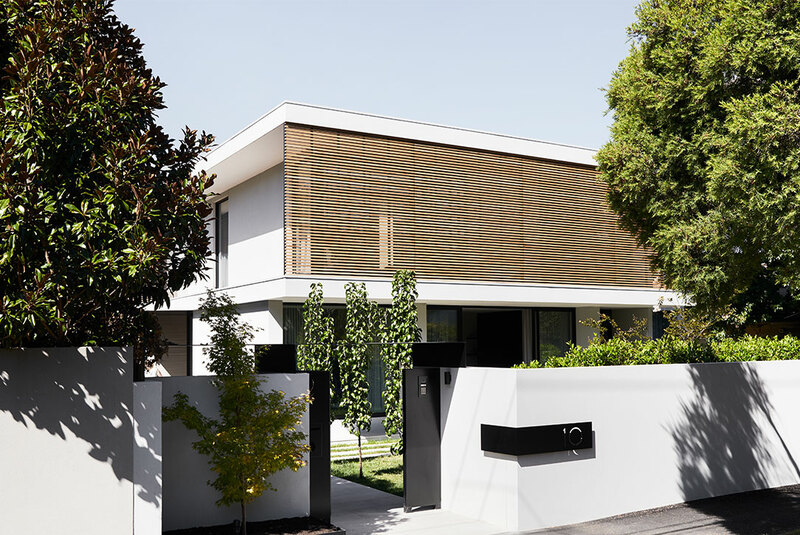 A neighbourhood that, architecturally, is characterised by both old and new, the home is timeless in its modernity with rectilinear lines, robust materials, and a focus on the landscape. 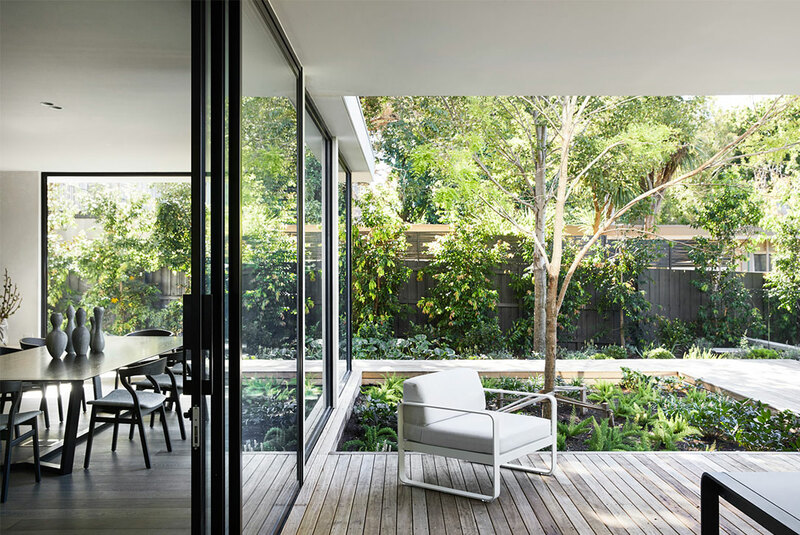 Built around a tree at the rear courtyard that the family loved, the design concept considered tree-lined outlooks, with full height glass framed by powder coated black steel to accentuate the greenery. Upon opening the custom pivot entry door, a large skylight above the open tread staircase creates a pleasing array of light and shades that change with the day. 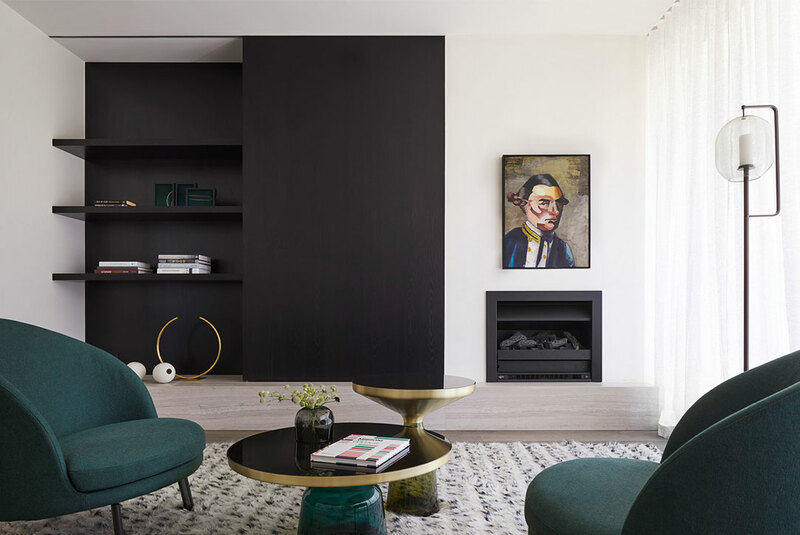 The polished plaster hallway wall suggests the subtle theme of customisation; further expressed through an interior palette of warm timber joinery (that cleverly conceals the television), leather pull handles, metal elements, natural stone, and soft, circular pendants and wall sconces.